The MSD-SRF2X Dual port RS-232 to Ethernet data gateway will address the need to add 2 RS-232C devices to an IP-based Ethernet LAN on your system, has built-in watch dog function for hardware hangs. Solution for connecting PLC’s, Meters, and Sensors to an IP based Ethernet LAN. Uses RJ45 port connection for 10/100 Network. Includes a built-in watch dog function designed to reset the MSD-SRF2XM when the hardware/software encounters an error. The MSD-SRF2XM Dual-Port RS-232 to Ethernet Data Gateway addresses the need to connect individual RS-232C devices, such as PLCs, meters, sensors, to an IP-based Ethernet LAN. It enables your application software to access serial devices anywhere on a local area network or the Internet. This RS-232 to Ethernet adapter is a ruggedly constructed metal chassis with its RJ45 connection, 12VDC power jack, and LED indicators conveniently located on the back panel, out of the way of any serial cable connection. 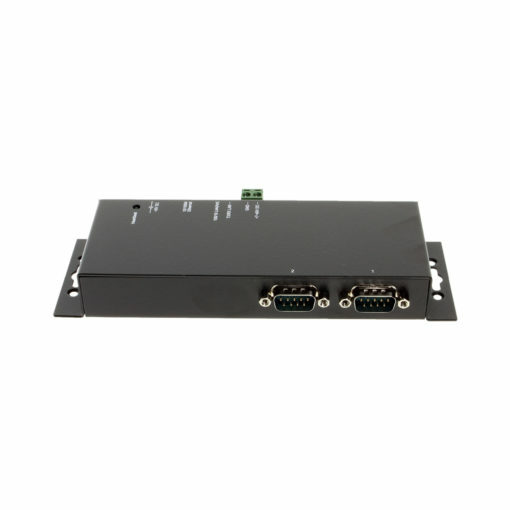 The Dual-Port RS-232 to Ethernet Data Gateway is easy to install and remotely connect through a variety IP addressing methods (UDP, IP, TCP, ICMP, HTTP, DHCP, ARP-Ping). Its rugged industrial-grade construction provides the ideal solution for applications requiring serial port environments and network device management. A built-in watch dog function is designed to reset the MSD-SRF2XM when the hardware/software encounters an error.